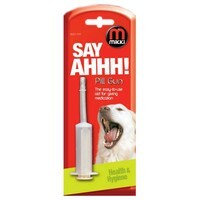 The Mikki Pill Gun is an easy to use method of administering tablets or capsules to your pet. Simply load the syringe with a small amount of water (to help your pet swallow) and place the pill in the claws. Hold your pet’s mouth open firmly and deposit the medication at the back of the throat by using the plunger. It may be necessary to hold your pet’s jaws closed and rub the throat area to encourage swallowing.